In my area, many of the more visible bike commuters tend to be nerdy engineers riding fairly expensive rigs with pricey accessories and clothing. To us engineers, riding a bike to work is an exercise in cost and time optimization. We bike because it makes sense, especially in highly congested Silicon Valley traffic. In the San Francisco Bay Area and many other locations across the U.S., however, there’s a vast population of ‘invisible’ cyclists. These are the workers riding cheap garage sale bikes with bags swinging from the handlebars. To them, they bike because they must bike. Bikes are a symbol of poverty and most of them would love to be shackled with the burden of car ownership. Many of us middle class “bike advocates” tend to sneer at these lower-income cyclists, but I think it worthwhile for advocacy groups to reach out to these groups. We should listen to their concerns, and I think we should work to change the mindset that riding a bike is a symbol of poverty. I left a similar comment at Paul Dorn’s Bike Commute Tips site on this topic of outreach toward Spanish-speaking bike riders. I convinced the Denver Regional Council of Governments last year to create Bike To Work Day promotional material in Spanish, and I’ve suggested the same this year to the Silicon Valley Bicycle Coalition. 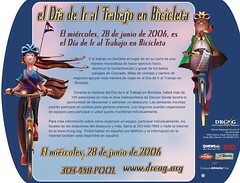 Is there any Spanish language outreach to cyclists in your area? I appreciate the “all cyclists are brothers” mentality—-but the vast majority of the “invisible cyclists” are illegal immigrants. Their very being here strains our infrastructure and adds to our tax burden. I will not do anything to make their time here any easier, thank you. That may make me a bad guy in the eyes of many, but I don’t care. Thanks for bringing attention to this need. Our Seaside Police Activities League (PAL) program is having a helmet giveaway as part of a pre-Amgen PAL Bike Fair, and in looking for the latest info about helmet fitting in Spanish, I came upon this post. In Monterey County, 2000 census said 40%, but I believe now it’s roughly half the residents are Hispanic and speak Spanish at home. There are certainly not nearly enough Spanish language materials for cyclists available–yet. What you said above rings very true in our area. Hospitality workers most frequent the bike path at night, riding home from their jobs. Recently, I brought up in a survey for the Bicycle Leadership Conference the idea of marketing affordable cargo bikes to Hispanic women. Those in lower income neighborhoods commonly tote babies and groceries on foot or by bus. A bike trailer such as the one I enjoyed when I parented young children could be so helpful to many parents. Changing the idea that cycling equals poverty, through positive marketing messages and in other ways, can help.